Rothenburg Germany, is a beautiful medieval city on the Romantic Road in Bavaria. It is well-known around the world and attracts millions of visitors each year. The attention is well-deserved. 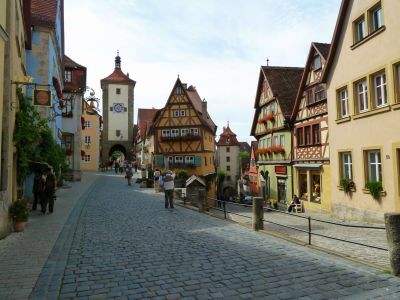 A visit to Rothenburg ob der Tauber shouldn't be missed when you are in Germany. Picturesque lanes, half-timbered houses and an intact fortification wall give you a good idea what a medieval town looked like nearly 1000 years ago. Wearing comfortable shoes is essential for a pleasant stroll on the cobblestones. Walk around the city (or parts of it) on top of the wall to enjoy the stunning views over the old town. The picture above is probably Rothenburg's most photographed sight. "Plönlein" (from the Latin word planum means even, or flat square) with the Siebersturm (left) and the Kobolzeller Tor (right). Both towers were built in the 13th century. 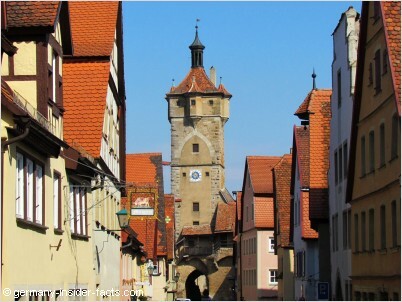 The stunning medieval architecture is not the only attraction in Rothenburg ob der Tauber. Discover the cultural heritage in museums, famous altar pieces in churches, and celebrate with the locals during historic festivals. Whichever time of the year you visit, Christmas is always present in the city. 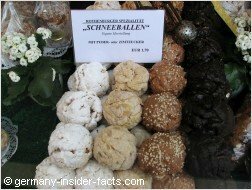 The German Christmas museum and the Käthe Wohlfahrt Christmas shops are open all around the year and attract everyone who loves German Christmas traditions and culture. Last but not least, enjoy the delicious local food and hospitality. Apart from the beautiful sights, you will also find practical information on this page. 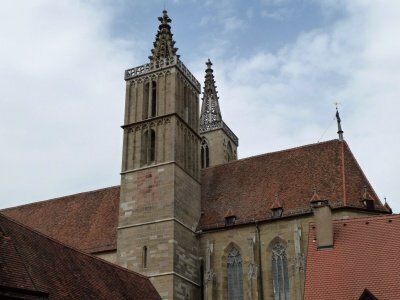 How to get to Rothenburg, tours from Frankfurt and Munich, hotel information, all the facts you need to plan your trip. 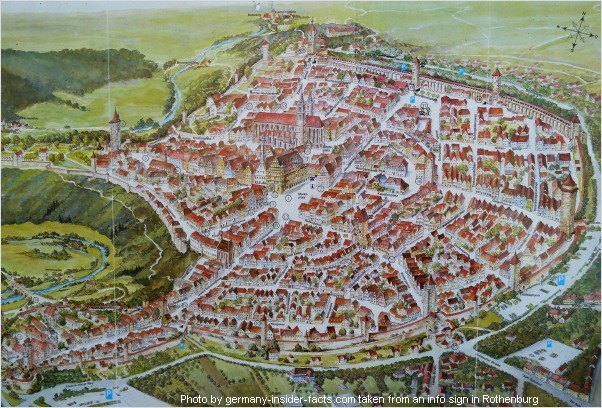 Come along, join me on a fascinating tour to the middle ages, explore all the treasures of Rothenburg ob der Tauber. 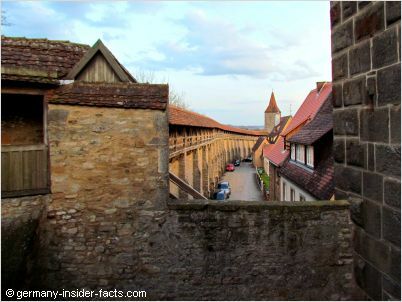 The medieval architecture and fortification wall are amongst the highlights of Rothenburg. Walk along the parapet for stunning views over the old town. 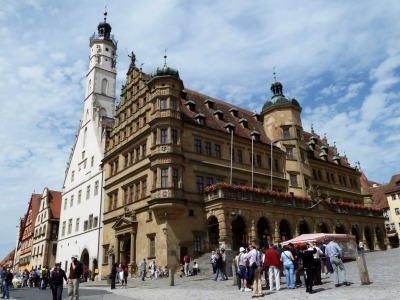 The market square with the impressive town hall, the Ratsherrentrinkstube and wonderful patrician houses is the meeting place for locals & visitors. Watch the key scene from the historical play "The Master Draught" at the Ratsherrntrinkstube. 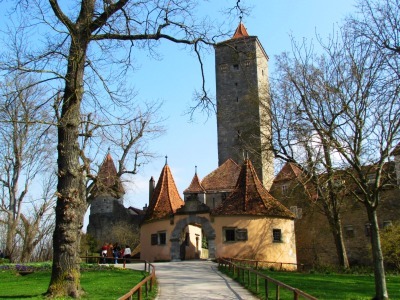 Rothenburg has quite a few interesting museums which shouldn't be missed. Kriminalmuseum (Medieval Crime and Punishment Museum) displays 1000 years history of law. Unfortunately, the Doll & Toy museum closed early 2014. Visitors can dream about Christmas all around the year at the Christmas museum. Browsing through the Käthe Wohlfahrt Christmas stores is a dream come true for many travellers. 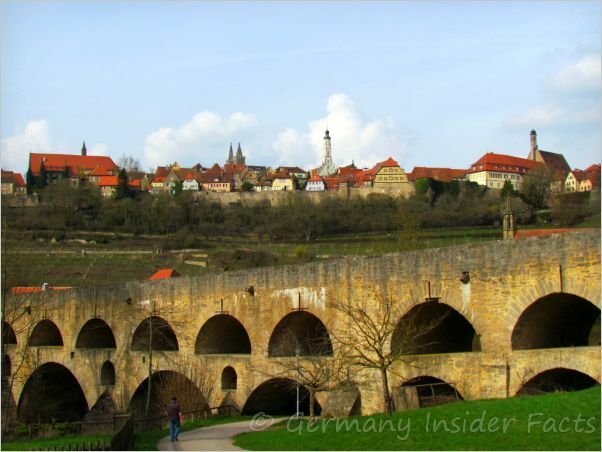 The historic double stone bridge spanning the Tauber valley dates back to the 14th century. 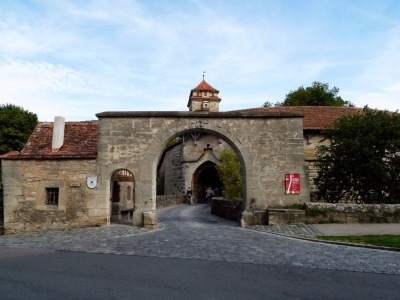 There are several gates (Tor) to enter Rothenburg ob der Tauber. Spitaltor is in the south, Rödertor & Galgentor in the east and Klingentor in the north. Whichever gate you take, you'll walk along romantic cobblestone lanes and finally reach the market square lined by beautiful houses and the impressive town hall. Explore the massive Spitalbastion before you walk along Spitalgasse towards the city centre. Walk through Sieberstor into the Untere Schmiedgasse, turn around and admire the famous Plönlein. Rödergate in the west is the only town gate you can climb. 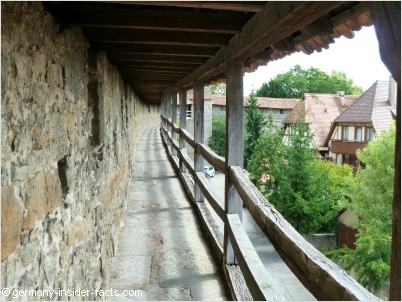 Continue along Rödergasse to Markusturm and Röderbogen, both remains of the first fortification built around 1200. Gallowsgate (Galgentor), also called Würzburger Tor is the highest point of the city, 438m above sea level. Walk down Galgengasse to the white tower, another remnant of the first fortification. The beautiful Judentanzhaus next to the tower reminds on the significant Jewish community in Rothenburg during the Middle Ages. The northern entry is at Klingentor which was a water tower and provided fresh water for the fountains in the early days. Within this bastion is St. Wolfgangs church. 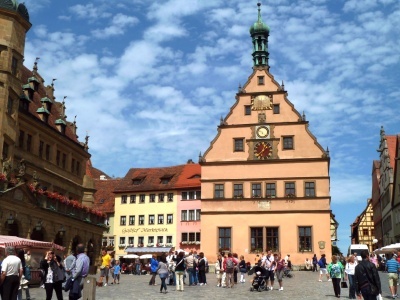 The Marktplatz (market square) is lined by splendid patrician houses and the impressive Renaissance facade of the town hall. The older part of the Rathaus, the white Gothic building, is accessible from Herrngasse. From the vaulted passage you can reach the town's vaults (Historiengewölbe). The eastern wing of the Gothic town hall burned down in 1501. It was replaced with the beautiful building you see on the Marktplatz today. 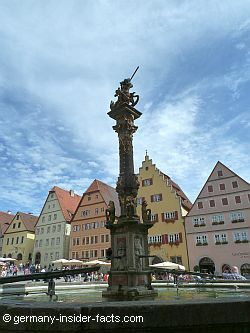 During the 30-years war Protestant Rothenburg was occupied by Catholic imperial troops, led by General Tilly. It is said that Tilly would spare the town and its citizens from punishment & destruction if one of the councillors manages to empty a huge tankard (3 1/4 litres) of wine in one draught. The former mayor Nusch was brave enough and managed the task. 1881 a theatre play was first performed commemorating the master draught. Every year at Whitsun Rothenburg's citizens turn back time and celebrate the Meistertrunk festival. Locals meet at the market place during the weekly market, tourists gather for guided walking tours, this place has always been brimming with life. The gabled Councillor's Tavern (Ratsherrntrinkstube) was once open only for men. Today it is home of the tourist information centre. A couple of times a day it attracts travellers every full hour between 11:00am and 03:00pm and between 08:00pm and 10:00pm to watch the key scene of the legendary master draught (Meistertrunk). Opposite the town hall is one of the loveliest fountains, Georgsbrunnen, it is the largest in the city as well. The wonderful half-timbered house behind the fountain is Marienapotheke (or Jagstheimerhaus) with a marvellous bay window. Next to it is the Fleisch- and Tanzhaus (Meat & Dancehouse). This is certainly an unusual name for a house, isn't it? Until the 18th century butchers sold meat in the basement, while the hall upstairs provided room for citizens to celebrate and dance. The Baumeisterhaus (Master-builder House) with its richly ornamented facade shows the seven virtues and the seven vices. Located in Obere Schmiedgasse not far from Marktplatz, you also have a wonderful view down that street to the Plönlein. St. Jacob's Church, errected between 1311 and 1484, is only a short walk from the market square. You won't miss the impressive building. Inside the church offers a wealth of religious art. 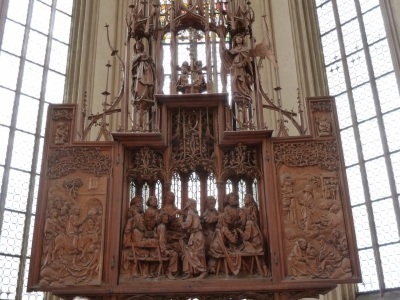 The High Altar in St. Jacob is the Zwölfbotenaltar (Twelve Apostles Altar). It shows colourful paintings by Friedrich Herlin and precious carved figures by Swabian artists. The display on the bottom (predella) shows Jesus among the apostles. The Heiligblutaltar (Holy Blood Altar) is the most precious piece of art in the church. The artwork displays scenes of Christi's life. 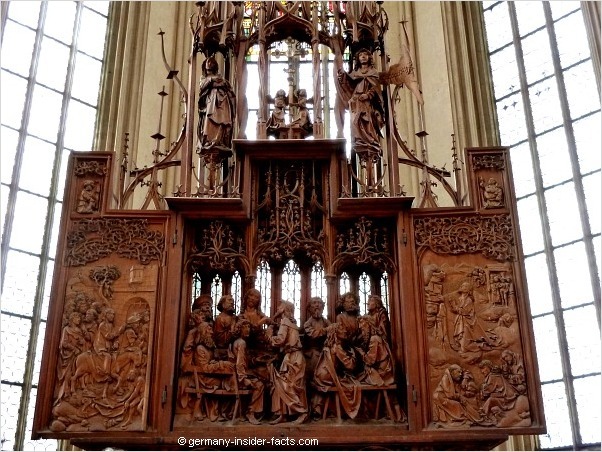 The expressive woodcarvings were performed by Tilman Riemenschneider between 1499 and 1505. The golden cross above the shrine holds an amber capsule, which, according to legend, contains 3 drops of Jesus' blood. Hence the name Heiligblutaltar. There are many more fascinating pieces of art to marvel at in this magnificient church. Take your time to explore the beauty of St. Jacob's Church. Guided tours are available on Saturdays from 3pm. You can also get audioguides for a small fee. 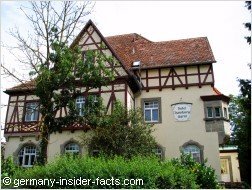 Due to the convenient location just a few kilometres west of the A7, it is easy to reach Rothenburg by car. Of, course, you can also take a leisurely drive along the Romantic Road to get there. Rothenburg's train station is only a 15 minutes walk east of the city. There are no direct connections from any major city as Rothenburg is not an ICE/IC train stopping point. So you certainly need to change trains once or twice. Check out connections and book your tickets online on the DB website. 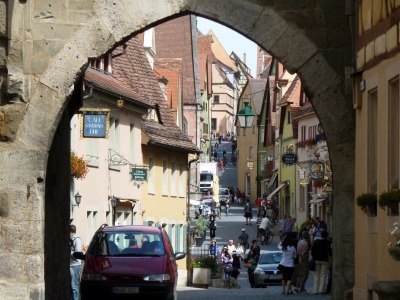 There is a wide range of tours from Frankfurt and Munich to Rothenburg. You can take a day tour from both cities, or multi-day tours to see additional attractions. One-way tours in both directions from from Frankfurt to Munich (or Munich to Frankfurt) are available. 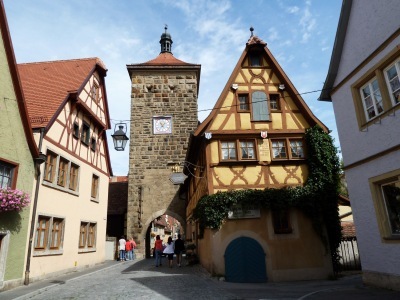 Mulit-day tours often have Rothenburg as one of the overnight stops which gives you plenty time to explore the city. 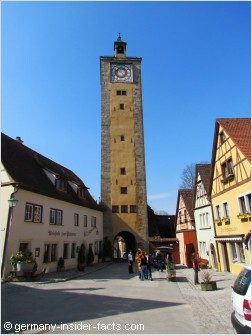 Check out Rothenburg Tours from Viator.com. Within the city walls there are lovely hotels in historic houses, great places to indulge even more of the old time charme. 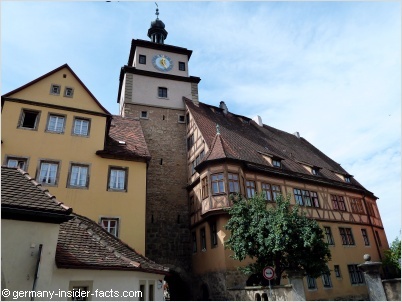 When you walk around Rothenburg ob der Tauber have a close look at the ornamented facades of the old houses, they tell you fascinating stories. The wrought-iron signs announcing hotels, restaurants and shops are splendid reminders of past crafts and exceptionally beautiful. 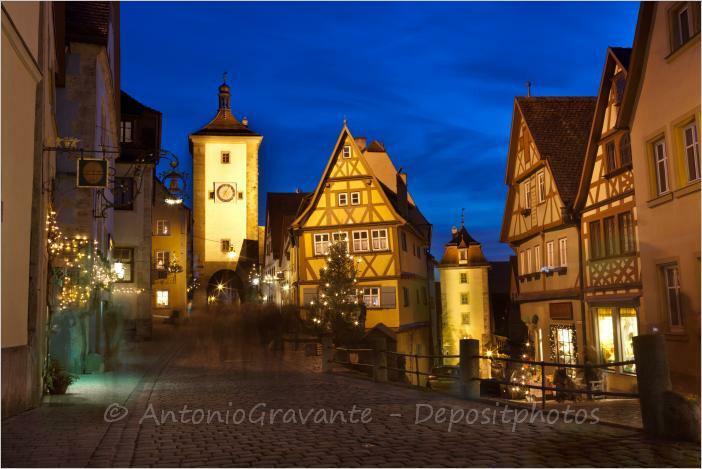 It is worth to stay at least one night to explore Rothenburg without hectic when the day-tourists are gone.